On the conceptual note evaluation of overpopulation is highly straight forward. Groups usually rely over the local geographical area for their nourishment and in cases if the productivity does not meet the demands placed by the group it naturally results in migration of the group towards a productive location. Sustainability could be explored as the ration between the totalities of the demands placed by the group to that of the ability of the geographical location to serve the demands. 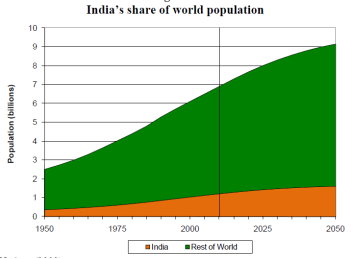 The following assessment would involve the assessment of overpopulation as an attribute stimulating opportunities and multiplying resistance for India’s growth and development. The 2oth century is a memorable timeline of population growth across the globe with the figures of inhabitants multiplying by 100% from that of 3 billion to 6 billion in just a span of 40 years. During this growth India has not gone exceptional in witnessing a rapid growth where it raised its population bars from 448 million to a whopping sum of 1.04 billion which has now reached 1.21 billion (Chakraborti, 2010). The following picture offers more insight over the state of rapid development that India is witnessing in contrast to the growth of world’s population (Chakraborti, 2010). In the past decades there have been 2 crucial breakthroughs that India has faced as a result of overpopulation. One is linked with that of the changing structure of age due to population and the other is the link of overpopulation over the state of population’s health (Mitra, 2009). Changes in age structure of the population in India has significant effects on the economic growth of the nation and this has been driven by the increasing proportions of baby boomers that was able to create echo effects (Srinivasan, 2011). In the past the whole Indian economy was reliant on the development of the youth which has now taken a transition to a positive note of its demographic profile, which has been stimulating the economic growth. India’s population health has been a crucial driving force under its economic development where in the healthier workforce in India was aiding the productivity of individuals and good health in turn multiplied the state of attendance in schools and institutions leading to enhanced education in India (Srinivasan, 2011). The growing population of India has been witnessing a strong decline across the infant mortality rates by about 70% in the past 60 years (Vignath, 2010). The number of deaths per 1000 people from 165 has now gone down to 50 today thanks to the increasing state of medical infrastructure that has been able to address mortality issues in India amidst the increasing rate of population. On the other hand the state of child mortality has also seen a positive transition with the number of deaths per 1000 children declining from 138 to that of 75 today (Chandrasekhar, 2011). The state of life expectancy in India has thus multiplied at a rate of 5 per each decade and the state of fertility rate has also seen a downfall from 6 children to that of women towards 2.5 per women (Vignath, 2010). The increasing age group of women under the reproductive age has been a driving force behind the increase in India’s population from 1.2 billion towards a strong projection of 1.6 billion by 2050. Amidst these the impact of overpopulation on the economic growth has been positive as the decreasing rates of crude births and death rates being a driving force (Mitra, 2009). India is turning more urbanized and it is evident from the totality of the people living in urban areas witnessed a growth of 18% during 1960 to that of 30% in 2008. During this lengthy timeline majority of the deaths 53% were influenced by the multiplication of chronic diseases and which are later influenced down by the decline that the country faced across reduced tobacco consumption, increased nutrition and a shift towards a sedentary lifestyle (Sharma, 2011). Environmental degradation in India is highly influenced by the extensive growth of its population which has been making adverse effects on the environment and natural resources. Majority of the poor people India lived across the rural areas with agriculture as their primary profession. There was abundance of programs that the government initiated under the anti-poverty and employment development aspects which was able to help the reduction of poverty ratios in the country. The growth of population aided the reduction of poverty rates in India where the nation had more than 55% of the population under the poverty line during 1974 and has shrinked down to 26% during 2000 (let, 2009). On the numerical count the population of people under poverty reduced from 320 million during 1975 to that of 260 million during 2000 (let, 2009). Amidst the reduction in the poverty rates in India considerable amount of impact was realized in the environmental degradation where in people who were not able to meet their basic needs were completely forced to make use of the natural resource that are under the common property resources (Mitra, 2009). Hence India was faced with severe exploitation of the natural resources and the excess pressure from the increasing population has influenced the degradation of the ground water. On the other hand the increased state of poverty in India has influenced the day to day activities of the poor to make use of the ponds and the rivers to contaminate and exhaust for their day to day activities. The outcome of such interventions has resulted in poor state of health for people who make use of the untreated water contents (Chandrasekhar, 2011). Both poverty as well as the increasing rate of population has been influencing the environmental challenges across India. Even though the positive signs of population growth have aided the growth of India’s economy in reducing Unemployment there exists abundance of environmental issues in India (Srinivasan, 2011). Out of all the nations in the globe India’s is exposed to huge volume of pressure in its agricultural land as a result of increasing population (Sharma, 2011). India’s geographical volume of 43% is contributing to the agriculture and the changing demographics have in turn influenced the changing patterns of land utilization. It is evident that the totality of India’s population has witnessed a growth of 3 times of the volume from 1950 to 2010 but these growth has been accompanied only by a low growth rate in total area of land for cultivation(20.7% 118 million hectares in 2010 from that of 142 million hectare during 1960) (Mitra, 2009). Majority of the growth in this regard has taken place as a result of the depletion of forest as well as graze lands. Increasing rate of land acquisition by the population of India is yet another critical issue of over population. On the purpose housing, building manufacturing units and industries the acquisition of land has witnessed a huge rise of about 10.5 million hectares in a span of 10 years (1990 – 2000) (Mukhopadhyay, 2012). Contrarily the increasing volume of agricultural extensfication is favouring the dominance of fertilizers which has resulted in water pollution (Vignath, 2010). Some of the worst outcome of agricultural extensfication is the negative impact that it creates over the state of bio diversity and poor state of health in oceans (Sharma, 2011). Degradation of both the land and soil is yet another important outcome of the increasing state of Population in India. The dominance of agricultural interventions and irrigation activities has increased the volume of water logging and most importantly the salination of the soil. The total geographical area of India is near to a volume of 330 million hectares of which about 175 million hectares are under the land degradation with both water and wind erosion topping the list of charts for about 150million hectares (Ranade, 2011). The outcome of soil erosion in India has resulted in increasing number of landslides, deforestation, and floods respectively. The current state of increasing population in India is highly degrading the scope for promoting enhanced food security and sustainability in the forestry context (Ranade, 2011). Increasing population growth trend in India has resulted in declining rates of the per capital availability of forest and agricultural lands. It is evident that the current per capita of forests in india is much lower than the average of the entire worlds per capita (Mukhopadhyay, 2012). Despite the increasing number of intervention being imposed by the government of India to address the declining per capita the increasing state of population has been hindering the ability of accomplishing objectives of gaining high per capita availability (Vignath, 2010). Bio diversity has increasing value across the state of development in food, agriculture and medicine in India. But increasing population trends has influenced the destruction of Bio diversity in a positive manner; currently India is facing a threat of losing the habitats permanently. The increasing population trends have been increasing the human settlements and modernization of the agriculture is imposing negative impact on the local crops (Srinivasan, 2011). The current population trend in India is capable of offering a threat to more than 1000 animal species and sub species and a sum of 25,000 plants are under threat of losing their identity due to human acquisitions (Vignath, 2010). The economic and industrial development is underlying the rapid changes happening the patterns of consumption; it is evident that India’s strong economic growth has been reflecting in the increasing sales of the motor vehicles (Sharma, 2011). This has naturally resulted in noise pollution, air pollution, traffic jams and has depleted the agricultural lands for building more connectivity of roads. The following table offers insight in to the increasing number of motor vehicle resignation which is an outcome of the increasing population trends in India. It is evident that majority of the growth patterns in the motor vehicle registration has reflected the consumption across metropolitan cities (Vignath, 2010). During 2000 the total population in India was near to 1 billion and at that stage for every 1000 people there were 9 motor vehicles getting registered and it is projected that the population of India is projected to increase to 1.4 Billion which will make the statistics to increase as 44 vehicles for every 1000 people (Mitra, 2009). Thus the projections strongly emphasize the multiplying number of environmental issues as a result of the increase in the motor sales which ultimately results in accumulation of garbage, sanitation and poor housing issues. Increasing level of consumption with reference to the gas, oil and petroleum has also been depleting the non-renewable resources in India (let, 2009). Raising demand for energy is yet another crucial issue that India has been facing in the recent past with the production of petroleum related products witnessing a multiplication of 29 times of the actual volume from 2010. India has topped the list of world’s most air polluted nations and the growth of industries, households, transportation has been witnessing exceeding limits than that of proposed by the World health organization. Increase in Illness as well as pre mature deaths are blamed for the increasing number of air pollution in India as a result of over population (Sharma, 2011). The totality of damage caused for India through air pollution has crossed $ 1.3 billion every year and on the other hand the degradation of the water has multiplied the health cost to $ 5.7 million on yearly basis for India (Mukhopadhyay, 2012). It is evident from the analysis that over population has been favoring the state of economic scenario for India with increasing employment and purchasing power but has extensive negative impact over the environment and natural resource management. Chakraborti, D. (2010). The Greying of India: Population Ageing in the Context of Asia (Sixth Edition ed.). SAGE Publications. Chandrasekhar, S. (2011). India’s Population: Fact and Policy (Second Edition ed.). John Day Company. let, J. (2009). Infant Mortality, Population Growth An Essay on Population Problems and International Tensions (Tenth Edition ed.). Routledge. Mitra, A. (2009). India’s Population: Aspects of Quality and Control (Ninth Edition ed.). Abhinav Publications. Mukhopadhyay, K. (2012). Control of Population Growth in India: Statistical Review of Information (Third Edition ed.). Daya Books. Ranade, S. (2011). Population Dynamics in India (Second Edition ed.). APH Publishing. Sharma, K. (2011). Demography and Population Problems (Ninth Edition ed.). Atlantic Publishers. Srinivasan, K. (2011). Regulating reproduction in India’s population: Regulating reproduction in India’s population: (Second Edition ed.). Sage Publications. Vignath, P. (2010). India’s Population: A Study Through Extension of Stable Population Techniques (Fourth Edition ed.). Sterling Publishers. "Impact of Overpopulation in India." UKEssays.com. 11 2018. All Answers Ltd. 04 2019 <https://www.ukessays.com/essays/environment/impact-of-overpopulation-in-india.php?vref=1>. "Impact of Overpopulation in India." All Answers Ltd. ukessays.com, November 2018. Web. 19 April 2019. <https://www.ukessays.com/essays/environment/impact-of-overpopulation-in-india.php?vref=1>. UKEssays. November 2018. Impact of Overpopulation in India. [online]. Available from: https://www.ukessays.com/essays/environment/impact-of-overpopulation-in-india.php?vref=1 [Accessed 19 April 2019]. UKEssays. Impact of Overpopulation in India [Internet]. November 2018. [Accessed 19 April 2019]; Available from: https://www.ukessays.com/essays/environment/impact-of-overpopulation-in-india.php?vref=1.